Data stored in our computers is often crucial and in the event of a system crash or data corruption, chances of data loss can give us shivers. While we do try to maintain our systems most of us also keep an antivirus utility at hand to protect and secure our stored data easily and prevent any virus infection as well. Still, there can be several instances wherein users can face the hazards of data corruption owing to any varied reason that can pose problems. Any of these accidents can cause data loss which calls for stringent action and immediate thinking and hence the usage of Hetman Uneraser 2.0.6 can prove to be useful and practical solution for resolving this difficulty. Hetman Uneraser 2.0.6 contains an intuitive looking interface with all the major tools arranged suitably which makes it simple for the user to access its utility value and make it easier to protect information as required. Further, the users can work with this tool easily by utilizing a simplified and user friendly interface and works with any kind of media that is workable with the Windows facility such as the Windows explorer. The data recovery procedure of this application can work with several media devices such as photo cameras, memory cards and USB devices and even cell phones and hard disks. The applications scans the entire system and provides list of all the sortable and searchable files which are required to be recovered and presents a preview of sorts to the user post which decision can be made. To sum up, Hetman Uneraser 2.0.6 certainly comes across as a suitable and easy to work with utility with its user friendly tools and hence gets a rating of 3.5 points for its enhanced performance and superlative approach. When your computer power suddenly goes off or you see a blue "screen of death", the first thought that comes to your mind is whether the document you were working on is still there. In case of a minor hardware error, your information will be just fine, but worst case scenarios also happen and that's when you should start being worried. A power failure, a virus attack or a critical error on your hard drive may knock you out of work for a long time and destroy your data. If you happened to be in this situation, went through it and know very well how hard and expensive it is to restore information bit by bit, you should have a tool that will help you quickly recover your data after it was deleted - either intentionally or after an unfortunate accident. Hetman Uneraser was created specifically for these needs. 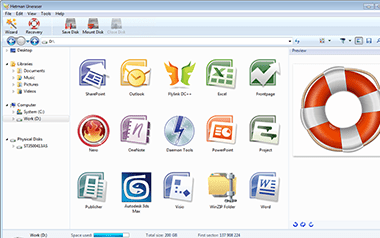 Offering a simple interface similar to that of Windows Explorer, it works with virtually any types of modern and legacy media, such as HDDs, photo cameras, USB devices, phone memory cards, cell phones, ZIPs and 3.5" disks. No matter which file system you use - FAT16, FAT32 or NTFS - Hetman Uneraser will be an equally efficient file recovery tool. The software scans the desired location and displays a searchable and sortable list of recoverable files that you can preview prior to starting the unerase process. Being able to preview a file is a guarantee of its 100% recoverability. But even if the file can't be previewed, there is still a good chance that you will be able to recover lost data. Hetman Uneraser supports all file types and will be able to recover your files even after hard drive re-formatting. Hetman Uneraser will be your 911 file recovery service available around the clock. Simple and always efficient, it will help you recover lost data in situations when time is critical and there is no other help around. Get the trial version of the software and see for yourself how fast you can find the files that you deleted days ago! Backs up the user's important data and keeps it synchronized.